Canada’s conservative government, led by Stephen Harper, seems to be working hard to build up a reputation for irresponsibility in the international community. And they are succeeding: In October Canada failed to win a seat on UN’s security council. Critics have cited Canada’s foreign policy – including lack of action on climate change among other things – as the reason for this decrease in popularity and lost security council seat. Focusing on the criticism of climate change inaction, Canada’s behavior has been shameful as of late on all things related to emissions reductions, fossil fuel exports, censorship of scientists, and science funding – going so far that the democracy of Canada’s decision-making process has been called into question. So, what exactly is happening up in Canada? Federal science funding, especially for projects and initiatives related to climate change is taking a serious hit. Recently, federal climate science funding has been cut to the point that the ten year old Canadian Foundation for Climate Science and Atmospheric Sciences (CFCSAS) is no longer able to fund important climate science research initiatives across Canada (CBC article). W.R. Peltier, director of the Centre for Global Change Science at the University of Toronto notes that a major consequence of these research cuts is that Canada is withdrawing itself from the intellectual effort to understand and respond to climate change. On top of major funding cuts to climate science research, the nation’s top climate research vessel, the CCGS Admunson, is currently being used by oil firms BP and Imperial Oil (CBC article). The oil firms are using the ship – intended to increase understanding of climate change impacts – to explore environmentally fragile areas of the Arctic for potential drilling sites. It’s been called a “grave irony” that a vessel intended to help increase our climate change understanding is being used by the very parties profiting from increasing CO2 emissions. ArcticNet, the scientific research group running the ship, counters this view by stating that renting to oil companies provides much needed funds to keep the ship running. However, if scientific funding was a greater federal priority, this conundrum would likely not exist. To top off this anti-climate science behavior, on November 16 Canadians saw the death of Bill C-311, the Climate Change Accountability Act, and the only federal climate change legislation in Parliament (Suzuki article). The highly undemocratic killing of the bill happened without debate in a last minute vote called for by conservative senators at a time when many liberal senators were absent. C-311 was supported by the majority of MPs and two thirds of Canadians; It’s no wonder why this decisive move by Canada’s unelected decision-makers has left Canadians shocked and appalled at the state of Canadian democracy. The squashing of Bill C-311 came just in time for Canada to get down to Cancun’s UN Climate negotiations (COP 16) sans any kind of domestic climate commitment. While there, Canada’s shameful climate abuses earned the country the honor of “Fossil of the Year” , presented by the Climate Action Network (CAN), a coalition of international environmental group. CAN’s “Fossil of the Day” awards are presented to countries who “behave badly during climate negotiations”. 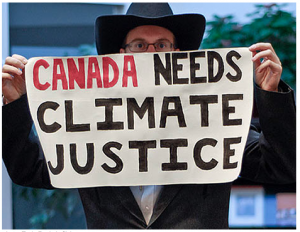 Of the countries receiving this honor at COP16, “Fossil of the Year” Canada was recognized as the worst of all. Not that this is a new honor for Canada; 2010 was Canada’s fourth year receiving the “Fossil of the Year” title. Conduct back home as well as efforts to prevent binding international climate policy that calls for strict emissions reductions from coming to fruition keep Canada in this unfortunate climate criminal spotlight. To end on a positive note, on December 7 the Canadian House of Commons passed a motion (143 – 138) that bans crude oil tankers off the province of British Columbia’s coast. The Vancouver Sun reports that this motion came to the House soon after the Parliament’s environmental watchdog pronounced Canada to be unprepared to cope with a major oil spill, should one occur. However, as the motion is not yet binding legislation, the conservative government can decide to ignore it; The Enbridge pipeline, an environmentally risky proposal which would pipe Alberta’s oil sands crude to BC’s coast for international export is still be furiously pushed forward. Until the opposition pushes some real legislation into place, there is no telling how far the current government will take its climate abuses.